In our Winter Update we shared some inspiration for a new lake house project we're working on with Stick Victorian references. The tight site requires a compact footprint and three stories to maximize the living space. 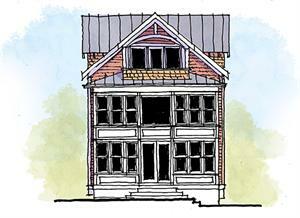 The third story features a covered "moon porch" - stay tuned for more details on Facebook as we move into design development.